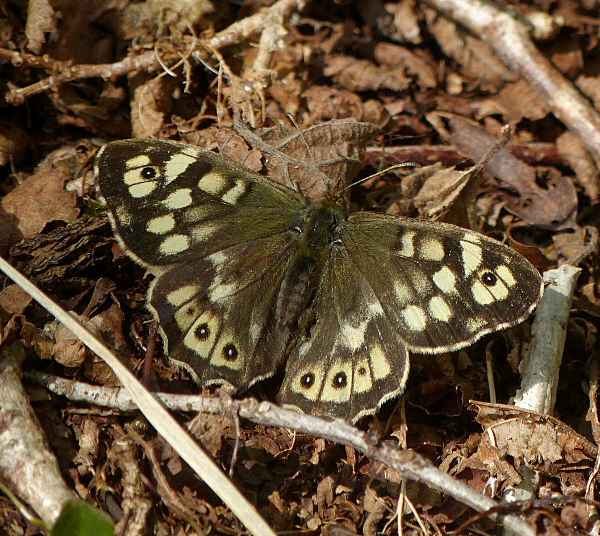 The Speckled Wood is a common woodland butterfly in our area, though it is absent from many parts of Scotland. It is doing well and currently increasing its range. They seldom visit flowers, but can often be seen basking or chasing each other in sunny openings in the woodland. Their dappled appearance makes them well camouflaged when not in motion. This is a female, with a greater extent of pale markings on the forewings than the male, but with smaller black eye-spots on the hindwings. 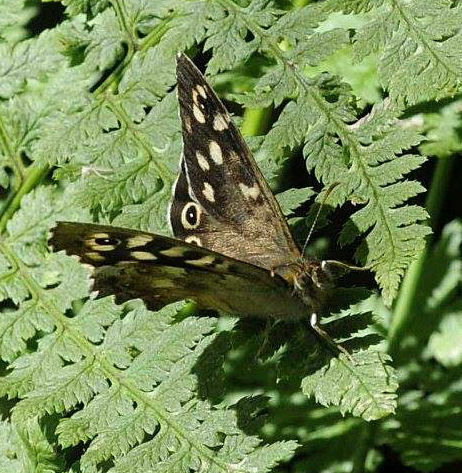 The male, shown in this photo from Knapdale by Caroline Anderson, has smaller pale markings on the forewings, but has large black eyespots on the hindwings. They often land on ferns, as in this photo from Ballachulish by Jan Hamilton. 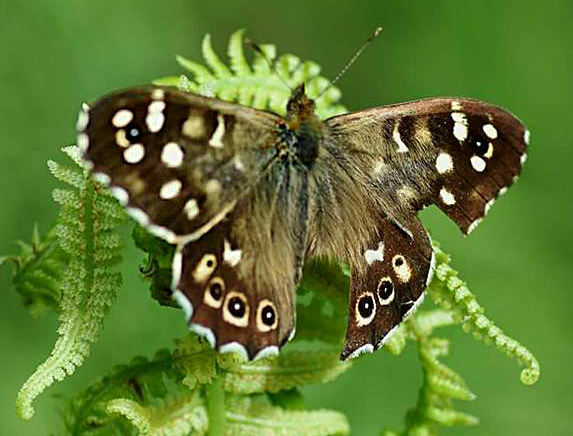 The Speckled Wood has two generations per year, but the picture is complicated by the fact that some of the first generation, and therefore also their second generation offspring, get an earlier start than others due to their overwintering habits. "This species is unique among the butterflies of the British Isles in that it can overwinter in 2 stages, as both a larva and pupa. 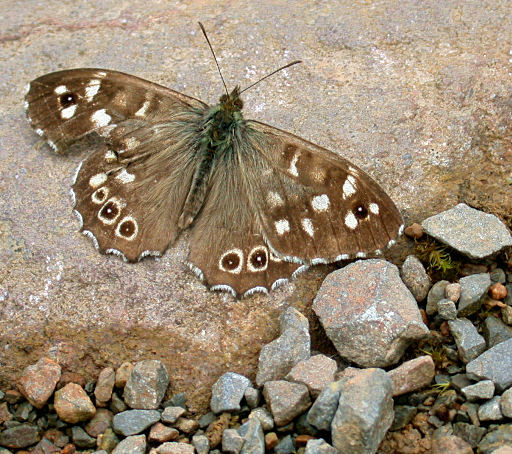 As a result, there is a mixed emergence with adult butterflies on the wing from April through to September, with a few adults being seen as early as March or as late as October" from the UK Butterflies site which has a huge amount of info on the Speckled Wood and other butterflies. The chart below shows the Speckled Wood records on our database arranged by time of year. Make of it what you will! The more records people send in, the clearer the picture will become. Two Speckled Woods from the same time and place. One kept landing with its wings closed and in the plane of the sun, as if to minimise the sunlight on its wings. The other did the opposite and exposed its wings fully to the sun every time it landed. Perhaps it depends on whether you're more concerned about warmth or visibility to predators. Speckled Wood on a fallen tree at Glen Nant national nature reserve, Taynuilt, where these butterflies are very plentiful, as the reserve has many of the sunlit glades that they like. Speckled Woods in the west of Scotland belong to the subspecies "oblita". 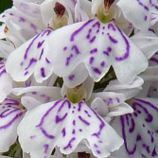 It has whiter spots than the English subspecies, and this is especially so in the far north. This one is from Skye in 2003. Please send in your Speckled Wood sightings using the form below, or email sightings@lnhg.org.uk with the details if you prefer. 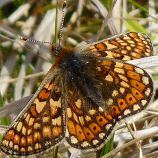 If you are not sure of the identity of your butterfly, please send a photo to sightings@lnhg.org.uk, or put one on the LNHG Facebook page. By filling in this form you agree that the information contained in this form may be collated and disseminated manually or electronically for environmental decision-making, education, research and other public benefit uses in accordance with the LNHG data access policy. Your email address will not form part of the record and will not be passed on to anyone. All photos and other content copyright © Carl Farmer except where stated. The 2nd Speckled Wood photo is © Caroline Anderson and the 3rd is © Jan Hamilton. Mouse over photos to see credits.